Mother’s Day is a time to celebrate the special women that make “Life “ possible for us. It is a time to honor the Ladies that raise and nurture us and guide us to fulfillment. Show them how much you treasure them by spending time with them. Take a walk together, make a favorite family recipe, create some art, or attend one of their favorite past times with them. This Mother’s Day List is a special one for sure. It has lots of beautiful treats for our mothers! Send mom some thing for Mother’s Day, and then set up a plan to send her something each month to remind her of just how important she is. One of my most special memories of this last year was creating lists, with her sitting by my side, helping me & laughing with me and giving me the extra push to make work here at Udorami meaningful and unique! Thanks MOM! I miss you and I love you! 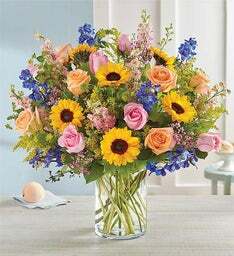 "Spring is a time to enjoy all the beauty around you—and our gorgeous bouquet is no exception! Featuring a French country garden-style mix of pink, blue, yellow and peach blooms artistically hand-designed by our skilled florists, this luxurious arrangement delivers the best part of the season right to their door." 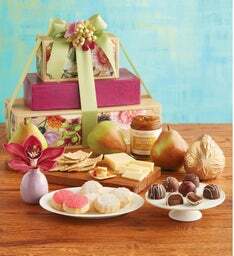 "Thank Mom with a towering collection of delights topped with a hand-tied bow. She'll love opening this series of beautiful boxes filled with delectable Mother's Day treats, such as buttery shortbread cookies made in our bakery and signature chocolate truffles from our candy kitchen. This unique gift comes with a wearable orchid corsage that also comes with a sweet ceramic vase she can continue to cherish long after the day is over." "EXCLUSIVE It’s a day meant for Mom to enjoy. Treat her to the ultimate indulgence with our decadent three-in-one Mother’s Day gift! We start with six plump, ripe strawberries: three covered in creamy Belgian milk chocolate and drizzled with sweet pink ribbons; three covered in rich dark Belgian chocolate and featuring “M-O-M” spelled out in white chocolate letters. Then we add six mouthwatering Oreo® cookies, dipped and swirled in the finest Belgian chocolate as well. And for the perfect finishing touch, let her savor our Belgian chocolate flowers, each one hand-decorated so that no two are exactly alike…just like Mom!" "Give her the royal treatment with this luxurious spa gift basket featuring premium Cherry Blossom products by Source Vérité. Using a sophisticated and subtle blend of natural Asian spices and citrus fruits, Source Vérité Cherry Blossom products are carefully crafted in the U.S.A. to nurture both body and spirit. Send the gift of soothing indulgence!." "Pink roses send a message of love and gratitude for the person who you admire and appreciate. The brilliant pink miniature blooms are complemented by the rustic tin planter in robin's-egg blue. This mini rose plant is the perfect thing to brighten up any room in the house, or bring someone special a fragrant, vibrant gift for any occasion." 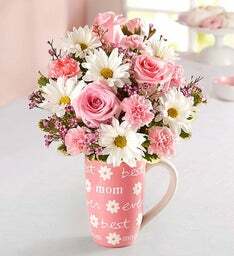 "Send Happy Mother's Day wishes with the best of Fannie May. This assortment features a selection of our signature tastes - from Pixies® and Trinidads® to toffees, buttercreams and crunchy nut clusters." "Mother’s plant the seeds that bloom forever! 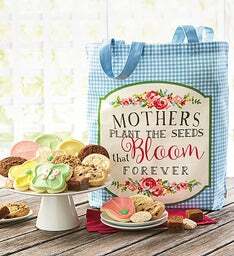 Our heartfelt printed cloth tote arrives filled with a tasty assortment of snack size cookies and brownies, pretzel clusters, buttercream frosted cookies including pretty flowers and butterfly cut-outs and buttercream frosted strawberry, lemon burst and key lime white chocolate cookies. Tote measures 10 1/2" x 4" x 15". OU D. 23 pieces." "She’s the apple of your eye. 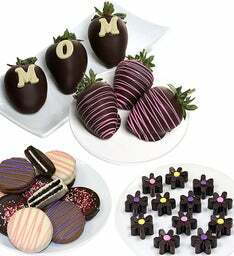 Let Mom know by sending a delightful dipped treat! Three of our fresh, crisp Granny Smiths are dipped in caramel and scrumptious Belgian chocolate, then decorated in pink chocolate drizzle. 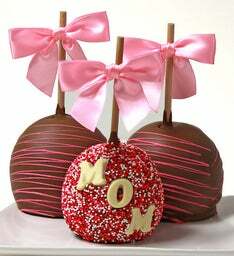 One extra special apple even spells out “Mom” in chocolate letters, so there’s no mistaking who this yummy gift is for." 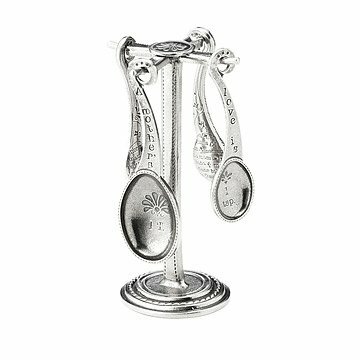 "Lovingly rendered with an ornate design, this set of pewter measuring spoons adds a personal touch to a mother's kitchen. Jim and Deborah Chapman are a husband-and-wife team whose diverse artistic backgrounds inspire intricate designs. This set of four measuring spoons, complete with hanging rack, is lovingly etched with the phrase "A Mother's Love Is Beyond Measure." The back of the spoons are also embellished with names for "mother" in many different cultures. Handmade in Eugene, Oregon." 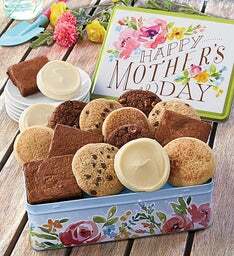 "Kind Notes® for Mom with FREE Cookies EXCLUSIVE Remember when you would leave your mom special little notes as a child? 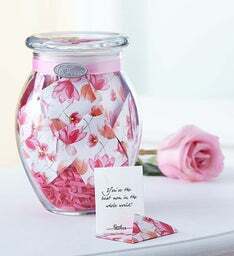 Relive those memories with our exclusive jar of 31 Kind Notes® written just for her! Each one features a touching message of love and affection, individually packaged inside a charming envelope. Whether it’s for Mother’s Day, her birthday or an unexpected surprise, this sentimental keepsake lets you express exactly how you feel to the amazing woman you call Mom. And because someone so sweet deserves an extra treat, complete her gift with flower-shaped shortbread cookies from Cheryl’s." 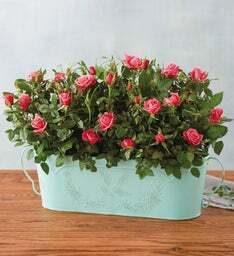 "Perfect for watering your spring flowers, but first you get to enjoy the treats! 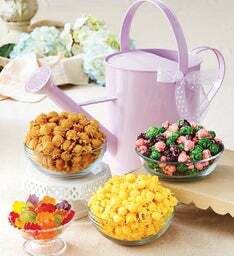 Our metal Water Can Sampler comes filled with Awesome Blossoms Gummi Candies and 3flavors of popcorn: Butter, Caramel and Spring Mix Kettle." "Our Ultimate Chocolate Cake comes from the Harry & David bakery. This original specialty cake is made with a unique combination of flavors. A layer of rich brownie fudge cake and a layer of our famous New York-style cheesecake are separated by a delicious brandy fudge filling. 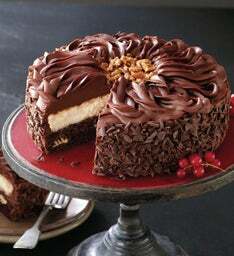 It's topped off with even more brandy fudge frosting and finished with pecans for a crowning touch." 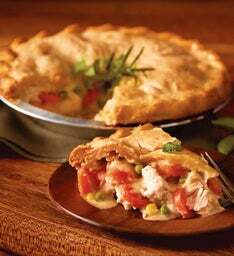 "Chicken Pot Pie is an irresistible classic that's graced the dinner table for generations. With flaky, hand-crimped pastry crust ensconcing moist, tender white meat chicken and flavorful vegetables such as carrots, peas, potatoes, and sautéed onions, this entrée is sure to please even the most pugnacious of palates. This dish serves six, enough for the full family to enjoy." "Send a pretty gift tin filled with our delicious assortment of gluten free fudge brownies and chocolate chip, brownie walnut, snickerdoodle and buttercream frosted sugar cookies. Our gluten free cookies and brownies are produced in a gluten free facility. 16 pieces. " 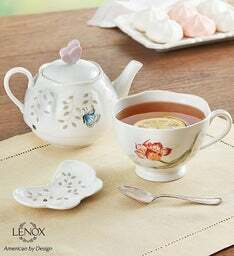 "Give Mom the chance to savor every sip—and every moment—with this exquisite tea for one set by Lenox®. Beautifully crafted in fine porcelain, the delicate stackable pot, cup and teabag holder are each designed in “Butterfly Meadow,” the most popular casual dinnerware pattern in America. What truly makes this keepsake so special is the way it will make her feel when she receives it…especially knowing it came from you." 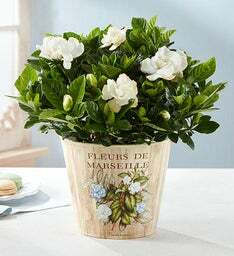 "With a delightful fragrance that fills the air and delicate white flowers that dot each stem, our elegant gardenia is a wonderful surprise for someone very special. What really sets this charming keepsake apart is the vintage botanical planter in which it arrives, featuring a charming “Fleur de Marseille” print inspired by the South of France. To truly enhance their gift, add our gardenia-scented Yankee Candle®."